This protocol focuses on the use of bacterial spores as a "live" nanobiotechnological tool to adsorb heterologous molecules with various biological activities. The methods to measure the efficiency of adsorption are also shown. Isticato, R., Ricca, E., Baccigalupi, L. Spore Adsorption as a Nonrecombinant Display System for Enzymes and Antigens. J. Vis. Exp. (145), e59102, doi:10.3791/59102 (2019). The bacterial spore is a metabolically quiescent cell, formed by a series of protective layers surrounding a dehydrated cytoplasm. This peculiar structure makes the spore extremely stable and resistant and has suggested the use of the spore as a platform to display heterologous molecules. So far, a variety of antigens and enzymes have been displayed on spores of Bacillus subtilis and of a few other species, initially by a recombinant approach and, then, by a simple and efficient nonrecombinant method. The nonrecombinant display system is based on the direct adsorption of heterologous molecules on the spore surface, avoiding the construction of recombinant strains and the release of genetically modified bacteria in the environment. Adsorbed molecules are stabilized and protected by the interaction with spores, which limits the rapid degradation of antigens and the loss of enzyme activity at unfavorable conditions. Once utilized, spore-adsorbed enzymes can be collected easily with a minimal reduction of activity and reused for additional reaction rounds. In this paper is shown how to adsorb model molecules to purified spores of B. subtilis, how to evaluate the efficiency of adsorption, and how to collect used spores to recycle them for new reactions. Display systems are aimed at presenting biologically active molecules on the surface of microorganisms and finding applications in a variety of fields, from industrial to medical and environmental biotechnologies. In addition to phages1,2 and cells of various Gram-negative and -positive species3,4,5,6,7, bacterial spores have also been proposed as display systems by two approaches8,9. Because of its peculiar structure, namely a dehydrated cytoplasm surrounded by a series of protective layers10, the spore provides several advantages over phage- and cell-based display systems8,9. A first advantage comes from the extreme robustness and stability of spores at conditions that would be deleterious to all other cells10,11. Spore-displayed antigens and enzymes are stable after prolonged storage at room temperature12 and protected from degradation at low pH and high temperatures13. A second advantage of spores is the safety of many spore-forming species. B. subtilis, B. clausii, B. coagulans, and several other species are used worldwide as probiotics and have been on the market for human or animal use for decades14,15. This exceptional safety record is an obvious general requirement for a surface display system and is of particular relevance when the system is intended for human or animal use16. A third, important advantage of a spore-based display system is that it does not have limitations for the size of the molecule that has to be exposed. In phage-based systems, a large heterologous protein may affect the structure of the capsid, while in cell-based systems, it may affect the structure of the membrane or may limit/impair the membrane translocation step17. The protective layers surrounding the spore are composed of more than 70 different proteins10 and are flexible enough to accept large foreign proteins without any evident structural defect or functional impairment8. In addition, with both spore-based display systems, the membrane translocation of the heterologous protein is not required8,9. Indeed, heterologous proteins are either produced in the mother cell cytoplasm and assembled on the spore that is forming in the same cytoplasm or adsorbed on the mature spore8,9. Spore display was initially obtained by developing a genetic system to engineer the spore surface18. This genetic system was based on i) the construction of a gene fusion between the gene coding for a spore coat protein (used as a carrier) and the gene coding for the protein to be displayed - the presence of the transcriptional and translational signals of the endogenous gene will control the expression of the fusion, and ii) integration of the chimeric gene on the B. subtilis chromosome to grant genetic stability. A variety of antigens and enzymes have been displayed by this recombinant approach, using various spore surface proteins as carriers and aiming at various potential applications, ranging from mucosal vaccine to biocatalyst, biosensor, bioremediation, or bioanalytical tool8,13. More recently, a different approach of spore display has been developed19. This second system is nonrecombinant and relies on the spontaneous and extremely tight adsorption of molecules on the spore surface9. Antigens19,20 and enzymes13,21 have been efficiently displayed and have revealed that this method is significantly more efficient than the recombinant one. This nonrecombinant approach allows the display of proteins in the native form20 and can also be used with autoclaved, death spores19. The molecular mechanism of adsorption has not been fully clarified yet. The negative charge and the hydrophobicity of the spore have been proposed as properties relevant for the adsorption13,19,22. Recently, it has been shown that a model protein, the red autofluorescent protein (mRFP) of the coral Discosoma, when adsorbed to the spore, was able to infiltrate through the surface layers localizing in the inner coat23. If proved true for other proteins, the internal localization of the heterologous proteins could explain their increased stability when adsorbed to spores23. In a recent study, two enzymes catalyzing two successive steps of the xylan degradation pathway were independently displayed on spores of B. subtilis and, when incubated together, were able to perform both degradation steps21. Spores collected after the reaction were still active and able to continue the xylan degradation upon the addition of fresh substrate21. Even if a loss of about 15% of the final product was observed in the second reaction21, the reusability of adsorbed enzymes for single, as well as multi-step, reactions is an additional important advantage of the spore display system. Pan et al.24 reported an additional approach to display heterologous proteins on the spore surface: heterologous proteins (an endoglucanase protein and a beta-galactosidase one) produced in the mother cell during sporulation were spontaneously encased in the forming spore coat, without the need of a carrier. This additional spore display system is a combination of the two approaches described so far. Indeed, it is recombinant since the heterologous proteins were engineered to be expressed in the mother cell during sporulation, while their assembly within the coat was spontaneous and, therefore, nonrecombinant24. However, the efficiency of display of this additional approach remains to be tested and compared with the other two approaches by using the same heterologous proteins. The present protocol excludes the processes of spore production and purification, which have been described extensively elsewhere24. It includes the adsorption reaction, the evaluation of the efficiency of adsorption by dot-blotting and fluorescence microscopy, and the recycling of adsorbed enzymes for additional reaction rounds. Incubate 2, 5, and 10 µg of mRFP with 2 x 109 of B. subtilis wild-type purified spores in 200 µL of binding buffer, 50 mM sodium citrate, pH 4.0 (16.7 mM sodium citrate dihydrate; 33.3 mM citric acid) for 1 h at 25 °C on a rocking shaker (Figure 1). Centrifuge the binding mixtures (13,000 x g for 10 min) to fractionate pellets (P2, P5, and P10) and supernatants (S2, S5, and S10). Store the supernatants for the indirect evaluation of the efficiency of adsorption described in step 3.2. Wash the pellets 2x with 200 µL of binding buffer and resuspend them in 100 µL of binding buffer and use it for the next analysis. NOTE: The binding reaction preferentially occurs at a pH value lower than the isoelectric point of the protein; typically, 1.5 M phosphate-buffered saline (PBS), pH 4.0, or 50 mM sodium citrate, pH 4.0, are used. Take 50 µL of mRFP-adsorbed spores' resuspension (P2, P5, and P10 of step 1.3) and add 50 µL of 2x sodium dodecyl sulfate (SDS)-dithiothreitol (DTT) (0.1 M Tris-HCl, pH 6.8; 2% SDS; 0.1 M DTT) to solubilize surface spore proteins. Use the free, purified mRFP and extracts of the same amounts of spores that are not adsorbed to the protein as positive and negative controls, respectively. After 45 min of incubation at 65 °C, centrifuge (13,000 x g for 10 min) the mixtures and analyze 10 µL of the extracted proteins (supernatant) by western blot with the monoclonal anti-His antibody recognizing the His tag present at the N-terminal of mRFP (Figure 2A). NOTE: By using fluorescent heterologous proteins or performing an immunofluorescence analysis, it is possible to localize and quantify the adsorbed molecules by fluorescence microscopy. Take 5 µL of the adsorbed spores' resuspension from step 1.3 and add 95 µL of 1x PBS, pH 4.0, to obtain ~1 x 106 spores/µL. Place 5 µL of suspension on a microscope slide, cover it with a coverslip previously treated with poly-l-lysine for 30 s, and observe it under a fluorescence microscope. For each field, save the phase-contrast microscopy image and fluorescence microscopy image (Figure 2B). NOTE: Alternatively, fluorescent spores can be analyzed by cytofluorimetry. 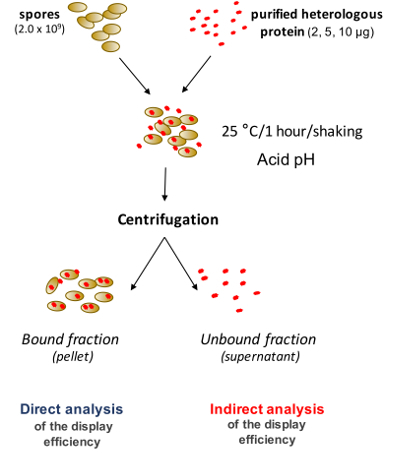 Resuspend a total of 106 spores adsorbed or not-adsorbed with the heterologous protein in 1 mL of 1x PBS, pH 4.0, and analyze the suspension using a flow cytometer (Figure 2C). 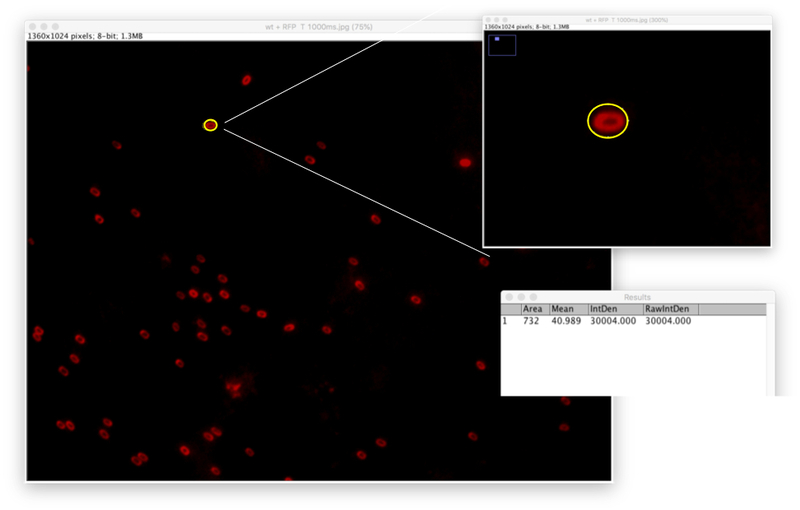 Open the fluorescence microscopy images with ImageJ software (http://rsbweb.nih.gov/ij/) and check to make sure all images are in the 8-bit format (Image | Type | 8-bit). Adjust the contrast if necessary (Image | Adjust | Brightness Contrast) and verify that the scale of the image is PIXEL (Image | Set Scale). From the Analyze menu, select Set measurements. Make sure to have Area, Integrated Density, and Mean Gray Value selected. Draw a line around the spore of interest using any of the drawing/selection tools (i.e., circle, polygon, or freeform) (Figure 3). Select Measure from the Analyze menu (or hit cmd + M). A popup box with a stack of values for this first spore appears (Figure 3). Repeat these two steps for at least 50 other spores in the field of view chosen to be measured. Select several regions without any spores (that have no fluorescence) and repeat the measurement; this will be the background. NOTE: The size is not important. These corresponding background fluorescence values will be used to manually subtract the background. Select all the data in the Results window and copy the results into a spreadsheet. Calculate the mean of the Integrated Density and Area of the selected spores and of the background fluorescence values and use them to obtain the corrected total-per-cell fluorescence (CTCF) using the formula: CTCF = mean Integrated Density - (mean Area x mean Background fluorescence). NOTE: Alternatively, if all the spores appear well separated, it is possible to analyze all the spores of the image field using the function Analyze Particles, following ImageJ's instruction. To avoid that the software reads a specific fluorescence or spore aggregates, the dimension of particles has to be set at pixelˆ2 = 50-200 (Figure 4). Prepare serial dilutions for the purified protein. Prepare a first 1.5 mL tube containing 250 µL of purified mRFP at a final concentration of 0.5 ng/µL, using the binding buffer. This volume is sufficient to load two lanes. Perform six twofold serial dilutions of 250 µL (final volume) each, using the binding buffer. Prepare twofold serial dilutions for the supernatant samples containing the unbound mRFP fraction of the adsorption reaction (S2, S5, and S10 from step 1.2). Put 100 µL of each supernatant in a 1.5 mL tube and add 100 µL of binding buffer. Perform six twofold serial dilutions of 200 µL (final volume) each, using the binding buffer. Cut a nitrocellulose membrane (0.45 µm cutoff), 9 cm x 10 cm in size, to cover the area of 5 (number of samples) x 6 (number of dilutions) dots. The membrane should not extend beyond the edge of the gasket of the dot blot apparatus. Place the prewet membrane in the dot blot apparatus. Remove any air bubbles trapped between the membrane and the gasket. Cover the unused portion of the apparatus with tape or paraffin film to prevent air from moving through those wells. Assemble the dot blot apparatus as described by the manufacturer. If a vacuum is used during the assembling, rehydrate the membrane with 100 µL of 1x PBS per well to ensure the uniform binding of the antigen and prevent halos or a weak detection signal. Gently remove the buffer from the wells by vacuum. As soon as the buffer solution drains from all the wells, stop the vacuum pump and disconnect it. Load the standard in the two most external lanes and the samples in the middle (Figure 5). Fill the appropriate wells with 100 µL of each dilution. The same volume used for each well should ensure a homogeneous filtration of all sample wells. Turn on the vacuum pump for 2 min, stop it, and then, allow the sample to filter through the membrane by gravity flow. Wash all the wells with 100 µL of 1x PBS and let the vacuum pump run for another 5 min after the washing buffer has been completely drained from the apparatus. With the vacuum on, loosen the screws, and carefully open the dot blot apparatus. Turn off the vacuum, take the membrane, and process it following a western blot protocol. Perform a densitometric analysis of the filter, using appropriate software, such as ImageJ. Measure the integrated density of each dot by outlining them with a circle of the same area and using the Analyze/Measure command. Make a background correction of the image, drawing a circle in an empty area and measuring its integrated density or using the Process/Subtract Background command. Correlate the integrated density of the standard dots with the amount of loaded protein and obtain a calibration line (R2 values for calibration curves should be over 0.95). Use the calibration curve to extrapolate the concentration of mRFP of each sample dot. Calculate the concentration of the mRFP remaining in the unbound fractions. NOTE: To ensure the correct closing of the dot blot apparatus and, therefore, to subject the membrane to a uniform pressure, tighten the screws by following a diagonally crossed scheme and, then, open the vacuum pump to tighten the screws more strongly. For the recycling of the adsorbed spore, perform two adsorption reactions of 2.0 x 109 purified spores with 10 µg of purified GH10-XA xylanase or 10 µg of purified GH3-XT β-xylosidase, as described in steps 1.1-1.3 (Figure 6A). Collect the pellets containing the enzyme-adsorbed spores, resuspend them in 50 µL of the optimal buffer for the enzymatic reaction assay (50 mM sodium phosphate buffer at pH 6.5; 2.48689 g/L Na2HPO4, 4.88991 g/L NaH2PO4), and mix them together to obtain a 100 µL mixture of spores adsorbing GH10-XA or GH3-XT. Add the substrate (5 mg/mL 4-O-methyl-d-glucuronod-xylan [MGX]) and let the enzyme reactions take place for 16 h at 65 °C. Centrifuge the reaction mixture (for 15 min at 13,000 x g) and store the supernatant containing the enzyme reaction product. Resuspend the pellet in 100 µL of fresh 50 mM sodium phosphate buffer at pH 6.5 in the presence of a new substrate (MGX) (Figure 6B). NOTE: To adsorb more than one enzyme, it is possible to adsorb both together or one by one independently. The latter possibility facilitates the quantitative analysis of the adsorption efficiency and of the activity of each enzyme, allowing a stoichiometric balance of each enzyme needed for the reactions. Successful adsorption can be assessed by western blotting. 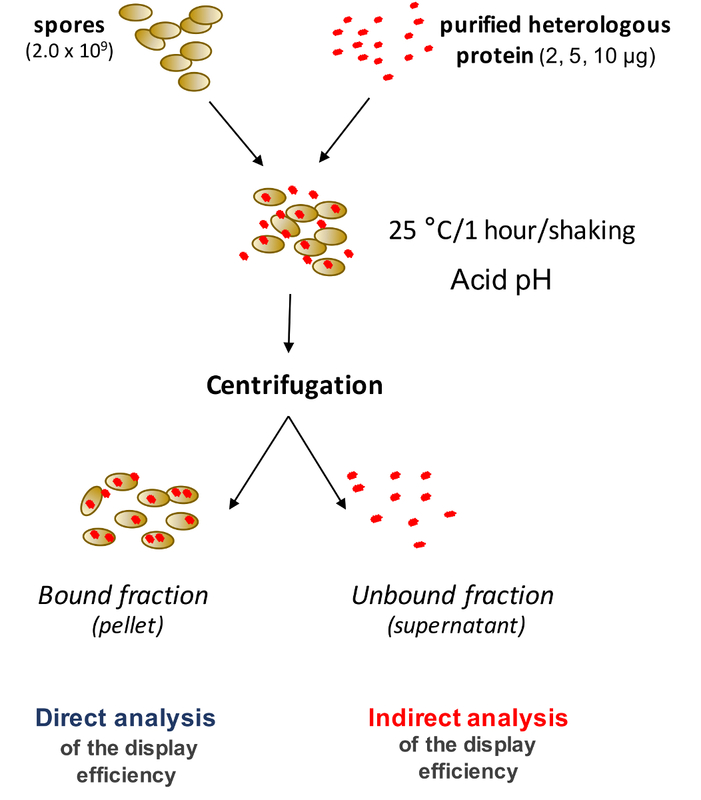 Upon the reaction, the mixture is fractionated by centrifugation and washed, and the pellet fraction (Figure 1) is used to extract the surface proteins. The extract is fractionated by SDS polyacrylamide gel electrophoresis (PAGE), electrotransferred to a polyvinylidene fluoride (PVDF) membrane, and reacted against primary and secondary antibodies. The presence of proteins of the expected size, only in the lane loaded with an extract of the adsorbed spores, is indicative of a successful adsorption reaction (Figure 2A). The efficiency of the adsorption reaction can be evaluated by direct and indirect methods. The direct evaluation of the adsorption efficiency depends on the heterologous protein that has been used and can be performed by fluorescence microscopy (Figure 2B) and cytofluorimetry (Figure 2C) on the pellet fraction after the fractionation of the adsorption reaction. A quantification of the fluorescent signals present on spores can be performed by using the ImageJ software (Figure 3 and Figure 4). An indirect analysis of the adsorption efficiency can be performed by a dot blotting analysis (Figure 5A) of the supernatant fraction containing the unbound protein (Figure 1). A densitometric analysis of the unbound protein (Figure 5B) will then allow scientists to calculate indirectly the amount of protein adsorbed on spores. Two successive reactions can be catalyzed by a mixture of spores displaying either one of the two specific enzymes (Figure 6A). The adsorbed enzyme(s) can be collected with a simple centrifugation step, washed, and incubated with fresh substrate for a new reaction cycle (Figure 6B). Figure 1:General scheme of the adsorption experiment. Please click here to view a larger version of this figure. Figure 2: Direct analysis of the efficiency of the mRFP display. 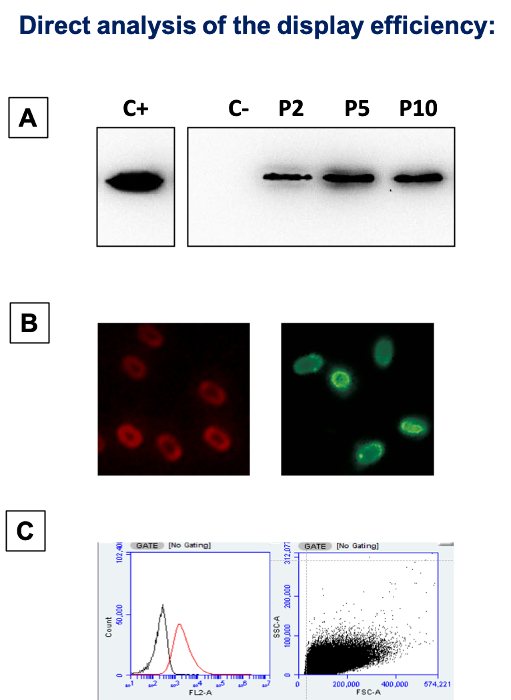 (A) Western blot with mRFP-specific antibody. C+ = free purified mRFP; C- = a protein extract from spores not adsorbed to the protein; P2/P5/P10 = proteins extracted from B. subtilis spores adsorbed with 2, 5, and 10 mg of mRFP, respectively. (B) Immunofluorescence microscopy of adsorbed spores. Immunoreactions were performed with a primary antibody recognizing the adsorbed protein and with a fluorescent secondary antibody conjugated with fluorescein isothiocyanate (FITC). The left panel shows the red intrinsic mRFP fluorescence, the right panel shows the green fluorescence of FITC-conjugated secondary antibody. (C) Flow cytometric analysis of adsorbed spores. The spores reacted with mRFP-specific antibodies and with FITC-conjugated secondary antibodies and, then, were analyzed by cytofluorimetry. The analysis was performed on the entire spore population (10,000 events, ungated). In the left panel, not-adsorbed spores are shown in black, mRFP-adsorbed spores in red. The right panel shows the forward and side scatter (FSC-SSC) dot plot. Please click here to view a larger version of this figure. Figure 3: Manual quantification of the fluorescent signal by ImageJ. A fluorescence microscope image of spores, adsorbed with the red fluorescent protein mRFP, analyzed with ImageJ software. A yellow circle has been drawn around one spore to obtain densitometric data (enlarged image). The popup box shows the results of the densitometric analysis of the selected spore. Please click here to view a larger version of this figure. Figure 4: Simultaneous quantification of the fluorescent signal by ImageJ. (A) Popup box obtained when selecting Analyze Particle. An interval value of 50-200 pixel^2 has to be set for spores23. (B) Segmentation of the image of Figure 3A after using Analyze Particles (left), and the relative densitometric analysis results (right). Please click here to view a larger version of this figure. Figure 5: Dot blotting and densitometric analysis. (A) Dot blotting with serial dilutions of the purified mRFP in duplicate (Std1 and Std2) and the supernatant (S10, S5, and S2) of the adsorption reaction performed with 10, 5, and 2 µg of mRFP, respectively23. (B) The dot blotting of panel A is used for the densitometric analysis. The circles indicate the area used to quantitate the density of the signals. The panel on the right reports an example of results obtained with the densitometric analysis. Please click here to view a larger version of this figure. Figure 6: Conversion of xylan by reusable spores. (A) General scheme of xylan degradation. (B) Spores displaying the xylanase or the β-xylosidase enzymes, when mixed together, catalyze the two-step degradation of xylan. After the reaction, the sample is fractionated by centrifugation. The supernatant contains the reaction product, while the pellet contains spore-bound enzymes that can be reused by adding fresh substrate. Please click here to view a larger version of this figure. This spore adsorption protocol is very simple and straightforward. The reaction is strictly dependent on the pH of the reaction buffer and the efficiency of adsorption is optimal at acidic pH values (pH 5.0 or lower). At neutral pH conditions, the efficiency of adsorption is low, and at alkaline pH values, adsorption may not occur. Optimal adsorption is obtained using a volume of 200 µL in 1.5 mL tubes (or keeping a similar ratio) on a rocking shaker. Adsorption is very tight, and washes with a buffer at the same pH of the reaction buffer do not cause any release of the adsorbed proteins. Washes with alkaline buffers may result in a minimal (generally less than 15%26) release of the adsorbed protein. The indirect evaluation of the efficiency of adsorption by dot blotting is reliable if several dilutions of purified and unbound protein are analyzed and the densitometric analysis is properly performed. No evidence of degradation of the heterologous proteins has been reported25. The direct evaluation of the efficiency of adsorption greatly depends on the protein that is adsorbed. If the protein is autofluorescent or fluorescently labeled, an ImageJ-assisted analysis provides a quantitative determination of the fluorescence and of the amounts of fluorescent molecules present on the spore. If the protein has an enzymatic activity, a specific enzymatic assay could provide an indication of the amounts of protein present on the spores. However, it is known that the enzymatic activity associated with spores may be increased by a stabilization effect due to the interaction with the spore13. If the adsorbed protein is not fluorescent and does not have an enzymatic activity, the efficiency of adsorption can be evaluated by dot blotting on spores extracted under drastic conditions. A collection of used spores can be done by a very simple procedure. A washing step with the reaction buffer may be important to remove reaction by-products, while the addition of fresh substrate is essential to initiate a new reaction21. This work was supported by "Finanziamento di Ricerca di Ateneo" to L. Baccigalupi, project title "SP-LAY: Bacterial spores as live platform for proteins display". Felici, F., et al. Peptide and protein display on the surface of filamentous bacteriophage. Biotechnology Annual Review. 1, 149-183 (1995). Cortese, R., et al. Identification of biologically active peptides using random libraries displayed on phage. Current Opinion in Biotechnology. 6, 73-80 (1995). Sousa, C., Cebolla, A., de Lorenzo, V. Enhanced metalloadsorption of bacterial cells displaying poly-His peptides. Nature Biotechnology. 14, 1017-1020 (1996). Richins, R., Kaneva, I., Mulchandani, A., Chen, W. Biodegradation of organophosphorus pesticides by surface-expressed organophosphorus hydrolase. Nature Biotechnology. 15, 984-987 (1997). Wu, J. Y., et al. Expression of immunogenic epitopes of hepatitis B surface antigen with hybrid flagellin proteins by a vaccine strain of Salmonella. Proceedings of the National Academy of Sciences of the United States of America. 86, 4726-4730 (1989). Newton, S. M., Jacob, C. O., Stocker, B. A. Immune response to cholera toxin epitope inserted in Salmonella flagellin. Science. 244, 70-72 (1989). Fischetti, V. A., Medaglini, D., Pozzi, G. Gram-positive commensal bacteria for mucosal vaccine delivery. Current Opinion in Biotechnology. 7, 659-666 (1996). Isticato, R., Ricca, E. Spore surface display. Microbiology Spectrum. 2, (5), (2014). Ricca, E., et al. Mucosal vaccine delivery by non-recombinant spores of Bacillus subtilis. Microbial Cell Factories. 13, 115 (2014). McKenney, P. T., Driks, A., Eichenberger, P. The Bacillus subtilis assembly and functions of the multilayered coat. Nature Reviews Microbiology. 11, 33-44 (2013). Knecht, L. D., Pasini, P., Daunert, S. Bacterial spores as platforms for bioanalytical and biomedical applications. Analytical and Bioanalytical Chemistry. 400, 977-989 (2011). Isticato, R., Cangiano, G., De Felice, M., Ricca, E. Display of molecules on the spore surface. Bacterial Spore Formers: Probiotics and Emerging Applications. Ricca, E., Henriques, A. O., Cutting, S. M. Horizon Bionsciences. Norfolk, UK. 193-200 (2004). Sirec, T., et al. Adsorption of β-galactosidase of Alicyclobacillus acidocaldaricus wild type and mutant spores of Bacillus subtilis. Microbial Cell Factories. 11, 100 (2012). Cutting, S. M. Bacillus probiotics. Food Microbiology. 28, 214-220 (2011). Baccigalupi, L., Ricca, E., Ghelardi, E. Non-LAB Probiotics: Spore Formers. Probiotics and Prebiotics: Current Research and Future Trends. Venema, K., Do Carmo, A. P. Caister Academic Press. 93-103 (2014). Cutting, S. M., Hong, H. A., Baccigalupi, L., Ricca, E. Oral Vaccine Delivery by Recombinant Spore Probiotics. International Reviews of Immunology. 28, 487-505 (2009). Lee, S. Y., Choi, J. H., Xu, Z. Microbial cell-surface display. Trends in Biotechnology. 21, 45-52 (2003). Isticato, R., et al. Surface display of recombinant proteins on Bacillus subtilis spores. Journal of Bacteriology. 183, 6294-6301 (2001). Huang, J. M., et al. Mucosal delivery of antigens using adsorption to bacterial spores. Vaccine. 28, 1021-1030 (2010). Isticato, R., et al. Non-recombinant display of the B subunit of the heat labile toxin of Escherichia coli wild type and mutant spores of Bacillus subtilis. Microbial Cell Factories. 12, 98 (2013). Mattossovich, R., et al. Conversion of xylan by recyclable spores of Bacillus subtilis thermophilic enzymes. Microbial Cell Factories. 16, 218 (2017). Pesce, G., et al. Surface charge and hydrodynamic coefficient measurements of Bacillus subtilis by optical tweezers. Colloids and Surfaces B: Biointerfaces. 116, 568-575 (2014). Donadio, G., et al. Localization of a red fluorescence protein adsorbed on wild type and mutant spores of Bacillus subtilis. Microbial Cell Factories. 15, 153 (2016). Pan, J. G., Choi, S. K., Jung, H. C., Kim, E. J. Display of native proteins on Bacillus subtilis spores. FEMS Microbiology Letters. 358, 209-217 (2014). Cutting, S., Vander Horn, P. B. Genetic analysis. Molecular Biological Methods for Bacillus. Harwood, C., Cutting, S. John Wiley & Sons. Chichester, UK. (1990). Lanzilli, M., et al. Display of the peroxiredoxin Bcp1 of Sulfolobus solfataricus probiotic spores of Bacillus megaterium. New Biotechnology. 46, 38 (2018).